Above top: The Daiguita-Calchaquies tribe lived in the mountainous north-western area of Argentina, and were largely responsible for the fierce opposition offered to the Spaniards on their attempts to invade the territory. The ace of coins is represented by an image of the first gold coin made in Argentina, in 1813. Above: The Ranqueles tribe (swords), descendants of the Araucanos, were the ethnic inhabitants of the pampas. They lived a hunter-gatherer lifestyle and resisted the white Europeans. They believed in a spirit of evil 'el galichu' and their beliefs were sometimes adopted by neighbouring tribes. Basket ware and weaving were their main crafts. The sword suit symbol is represented by a "facón caronero" a fighting weapon rather than a tool. The king depicts the legendary chief Mariano who liked to dress like a gaucho. 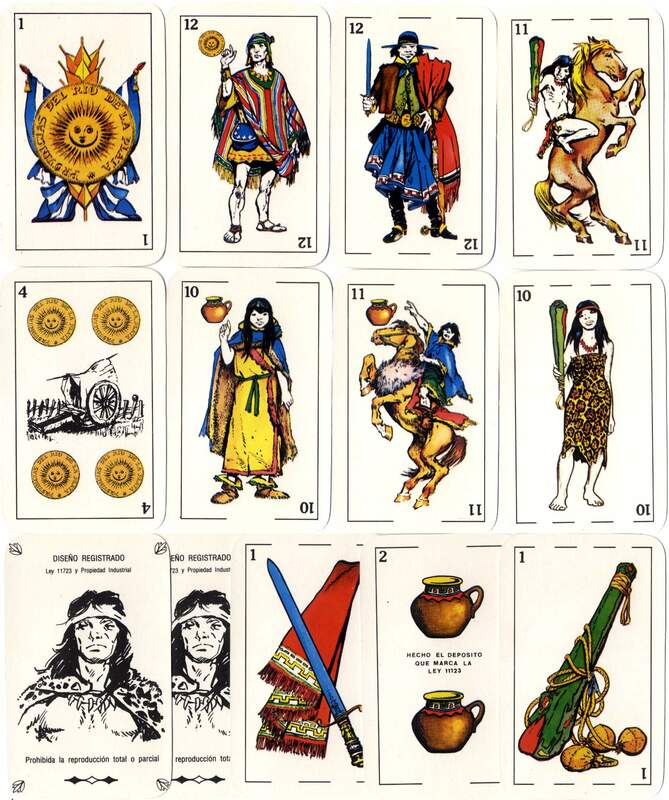 Above top: Ace and courts from the suit of cups, represented by a typical piece of ethnic tribal pottery and Patagonian Indians. Above: Ace and courts from the suit of batons, or clubs, represented by the macana - a commonly used weapon in inter-tribal war. 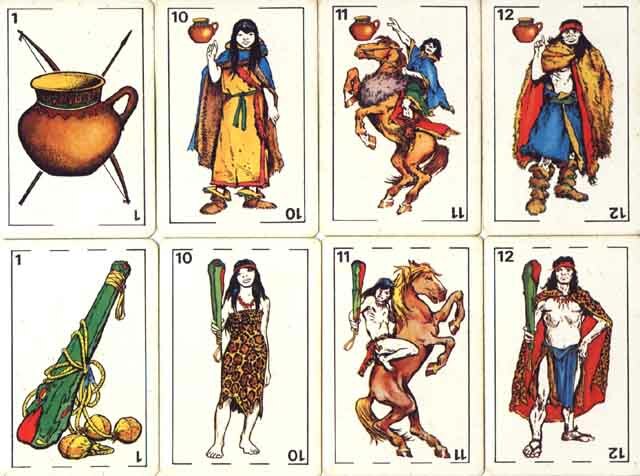 The Mataco tribe depicted on the court cards were indigenous to the north of Argentina. 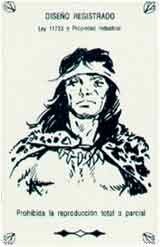 The leader of the tribe - number 12 - has also been featured on the Joker (right), giving a vague resemblance to Ché Guevara. 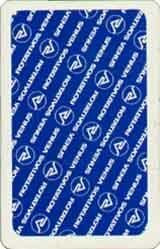 Left: The reverse of the cards shows a typographical design incorporating the name 'ROTATIVOS VENUS' and a logotype representing continuous stationery, the firm's main product. 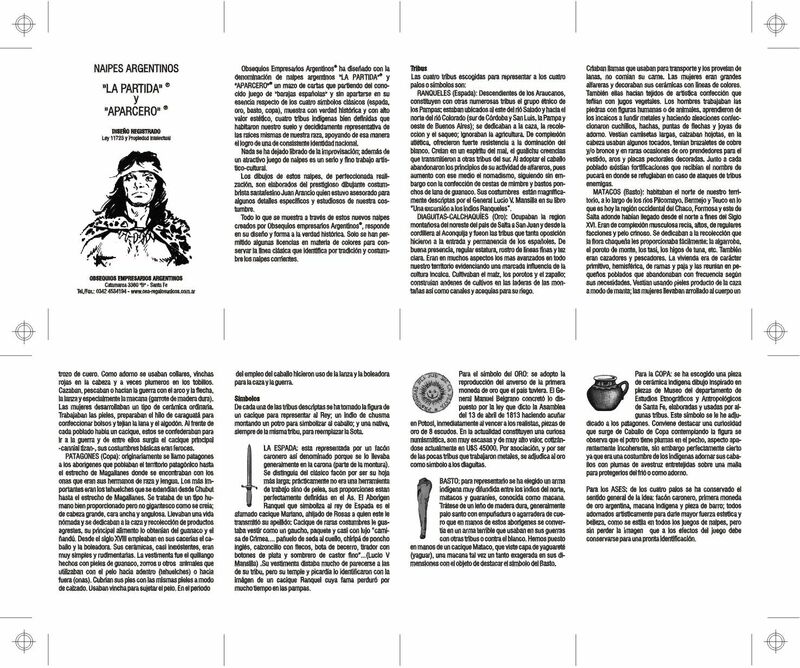 The example of Naipes Aparcero shown here was published by Obsequios Empresarios Argentinos, Buenos Aires in around 1983 for Rotativos Venus whose logo appears on the reverse. 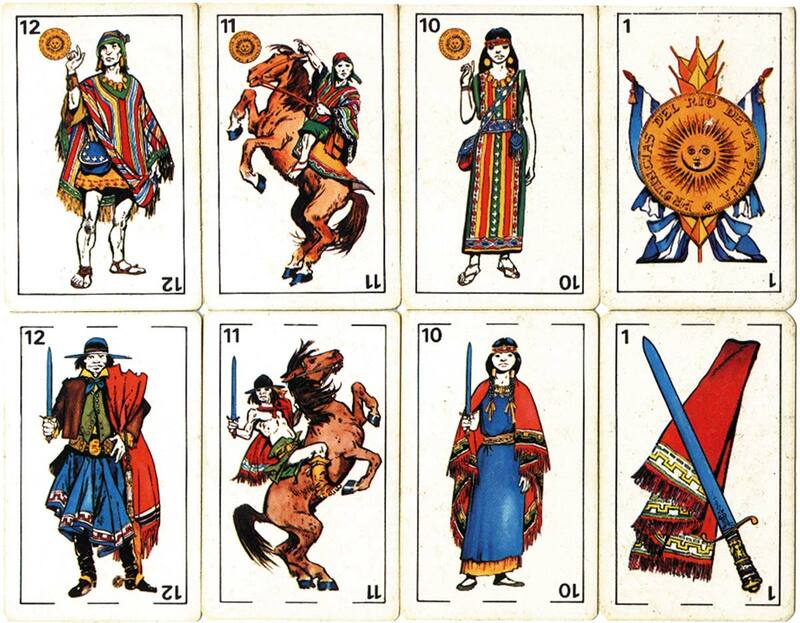 The cards are designed to illustrate the history of four indigenous tribes who represent the roots of the Argentinean race. The deck comes complete in a box, with two Jokers and an explanatory leaflet. BEFORE THE SPANISH finally entered Argentina in the 16th century, the country was sparsely populated and not homogenous in its cultural development. To the north was Bolivia and Perú, whose Inca empire at one stage expanded into Argentina.